Something strange is happening in the township of Woodbridge, New Jersey, just 20 miles outside of Manhattan. It started when a real estate development partner of Amazon.com purchased a nearly one-million square foot warehouse. The previous tenant was a grocery wholesaler and so the building is equipped with refrigeration. Now Amazon (AMZN) has quietly posted job listings for facility and operation managers in the area. 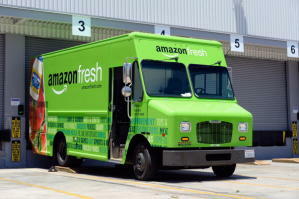 Last week a research analyst put the pieces together and came to the conclusion that Amazon.com is going to expand AmazonFresh into New York City. That means Amazon.com will be taking orders and providing same-day delivery to the nation's largest market. That may not mean much yet, but it suggests that the way eight million people buy groceries is about to change forever. The vision goes well beyond just groceries. Groceries are a Trojan Horse. The dirty secret of Amazon is that it really doesn't distinguish between a head of lettuce and a big screen TV. If Amazon can pull off same-day grocery delivery in NYC, it ostensibly means consumers can order anything online and receive it the same day. By logical extension, that means Jeff Bezos, the CEO of Amazon, is on the cusp of rendering every retailer on earth obsolete. 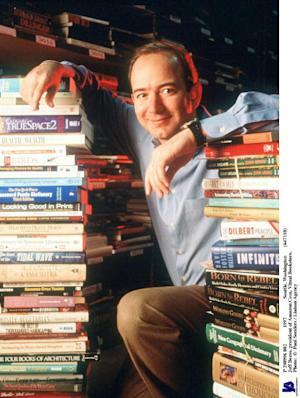 When Amazon.com went public in 1997, Bezos promised shareholders that the company had ambitions well beyond merely becoming the "world's largest bookstore." Bezos didn't outline exactly what that meant, but he vowed that the company would be run in the interest of pursuing opportunity rather than profits. True to his word, Bezos has built a $61 billion-a-year company that controls 5% of all e-commerce and earns next to nothing. While the critics howl about Amazon stock being overpriced, Bezos has used cheap funding from Wall Street to plow money back into the business at every turn. He has rewarded investors by endlessly expanding the company into different product categories and services. From books, Amazon moved into home electronics, sporting goods, apparel and Kindle tablets and apps. Skeptics predicted that no would buy such things online — Bezos has proved them wrong. What Bezos saw that others didn't was that his business was about distribution, not inventory or product categories. It turns out, customers will buy just about anything online if they get a good deal and reliable service. Forget books, TVs and groceries, Amazon has the potential to be the merchant of just about anything. "They're incredible, and they're doing it exactly the way Sam Walton built Walmart," says Howard Davidowitz of Davidowitz & Associates, in the attached video. "He built it by building infrastructure." Walton knew that winning over the long term meant controlling the timing of the shopping experience. While other retailers in the '50s and '60s relied on outside distributors, Walton built his own warehouses from which he would service Walmart (WMT) stores in the surrounding areas. That gave Walton a leg up on both cost and efficiency. While other retailers were waiting for goods, Walmart was sending out their own trucks. That may not sound like a big deal, but it's the foundation of the world's largest private employer. Walmart wins by being better, faster and cheaper than the competition. "That's the way Bezos is building this business: building infrastructure, building distribution centers all across America to service customers," Davidowitz says. He scoffs at the notion that Amazon would go to the trouble of buying a distribution center 20 miles from New York City just to sell produce. With the right system in place, Amazon will be able to deliver anything to customers the same day it's purchased online. Slowly but surely Bezos is eliminating the division between physical stores and shopping online. There's no such thing as "e-commerce" in Amazon's world. There is simply commerce. "I believe what Bezos believes," says Davidowitz. "He's going to be the only one who can really do same-day delivery everywhere." The only difference between products like groceries, sunglasses or TVs is how they are stocked and stored. Because Wall Street trusts Bezos to invest company income wisely, Amazon has the best, most highly automated warehouses in the world. Sometimes the product isn't even touched by human hands until it's unwrapped by the buyer. When Amazon started, it used standard USPS to deliver books. Now AmazonPrime customers can get two-day delivery for $79 a year. Going from two days to same-day isn't revolutionary, but it is simply the end of an evolutionary process that started when Amazon.com sold its first book in 1995. Shopping will mean going online, clicking away and waiting for one of Bezos' minions to deliver a box to your door. What the box contains doesn't matter in the least.